“Fly Fishing the upper Clear Fork River for brown trout: where, when and how.” By Dave Radomski, presented at the 5/11/15 CFRTU chapter meeting. Dave noted that he is not an entomologist, and does not know the names of all the insects he finds on the Clear Fork River, however his flies are tied to resemble insects he sees there. His presentation covered the area of the upper Clear Fork River from several hundred yards upstream from the blue bridge in Belleville to just downstream from where the river passes by the ski area in Butler. He never fishes downstream as far as the flat water where the white bass come up to spawn. He usually walks downstream to fish. Along that Belleville-Butler corridor he estimates that there are some 50 spots that he fishes. Depending on water conditions, not all spots are fishable during the year. He notes that the course of the stream changes each year with flooding rains. Some areas that held fish one year disappear but new ones are created the next. It is a dynamic system. Some big boulders and big trees are stable elements and maintain holding areas for the browns. Dave projected a series of Google earth maps showing the course of the river starting upstream from Belleville to downstream of Butler as noted above. Along the route of the river, he positioned yellow pushpins to indicate some of the best fishing spots. He noted the characteristics of a number of his favorite runs and holes. If there is a tree growing along side of the river, and its roots extend into the water creating a pocket or a run, there is at least one fish there, sometimes a big one. The same is true for logs and other structure in the stream that helps create a hole or run and can provide shelter. For each spot, Dave puts in two or three good presentations, and that is when he often hooks up. If after a dozen or so casts, and perhaps after changing flies does not produce a fish, he moves on. When to fish? When the USGS gauge on the Clear Fork River located in Bellville (https://waterdata:usgs.gv/usa/nwis/uv?03131982) reads 50 cubic feet per second or lower, is a good time to fish. Year round, when water temps are ca. 50-65 F with a little stain and good flow of water, is the best time to fish. Fishing can be especially good if a weather front is coming in, even with light rain. Early spring is the toughest time to fish the Clear Fork because of frequently changing water conditions. It is best to fish when there has been a period of stability. A black stone-fly (dry) in #14, to #18 works best during a hatch. A black wooly bugger (make it buggy) or minnow pattern (Mickey Fin) is also a good bet. Watch for a midge hatch; #20-#22 dry fly or emerger- pattern can work wonders. 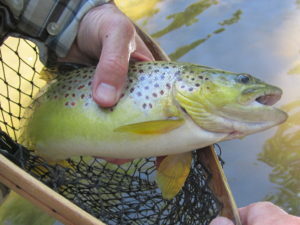 Mid- to late spring is the best time to fish the upper Clear Fork. Water temps in the 45-60F range area are prime. For smaller fish, Dave uses 5X through 7X tippets. However, the big fish will break off light tippets more often or not. For bigger fish and when using a streamer, he uses 4X tippet. For these fish he uses #8 hooks for streamers such as a zonker. When nymphing, Dave does not use a strike indicator or split shot. For fishing deeper pools, Dave weights his flies with tungsten bead heads. In late spring expect bigger fish and use streamer patterns. He uses a bushy wooly bugger in an olive color. Also throughout the mayfly hatches he tries to match color and size, and puts special emphasis on the tails of dry flies, making them from moose hairs (twice body length) so they will stand out. He believes trout key in on the tails. He always carries several sizes (esp. #16, #18) and colors. During summer months, forget streamers. Late August is the time to look for the light Cahill hatch. Again, try to match the hatch. Also fish big nymphs. There is plenty of dry fly action in the fall. During winter, as long as stretches are not iced over, the fish will bite. But slow it down, the water is cold and fish will move slowly to flies unlike with warmer weather when you cannot strip a fly too fast for a brown to catch up. Dave will fish when water temperature is up to 71F, after that he stays home. He often fishes twice per day. Good times to fish are at sun-up until 11 am. Then, later in the day, from 4 p.m. until near dark, is another good time to fish. Middle of the day is not so good. In Dave’s experience, 80% of the fish he catches are 8-10 inchers, 10% are 11-13 inchers, 5% are 14-16 inches and the remaining 5% are 17 inches or bigger. Very few areas are posted. If you are fishing the stream in un-posted areas, usually no one will bother you. It is where you park your car that can matter. Do not block a driveway or roadway and if you park on someone’s private land (farm, etc.) ask for permission. If you fish along the gold prospectors stretch downstream from Wade & Gatton Nursery, do not block a car or RV, chat it up with the prospectors, they do not mind if you are there. Dave gave his telephone number (419-544-0946) and told members to call for information regarding river conditions and fishing prospects..
Notes prepared by Randy Rowe, 5/16/15.